Pragmatic, incisive, and full of highly actionable advice, Yesil prepares ambitious women to break glass ceilings and rise to the top in the New Silicon Valley--and beyond. Magdalena Yesil is a founder, entrepreneur, and venture capitalist of many of the world's top technology companies, including Salesforce, where she was the first investor and founding board member. Her investing career started at US Venture Partners. She is a founder of Broadway Angels, an angel group of female investors. A technology pioneer, Yesil cofounded three companies dedicated to commercializing Internet access, e-commerce infrastructure, and electronic payments. UUnet, CyberCash, and MarketPay earned her the Entrepreneur of the Year title from Red Herring magazine. Her current company, DriveInformed, uses technology to bring trust and transparency to the auto finance industry. "This book is a must-read for anyone in business. 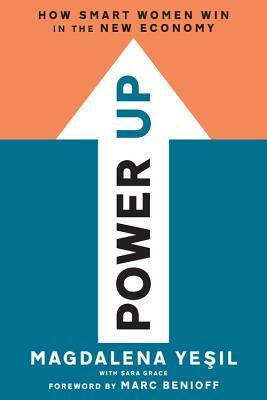 Power Up gives real, pragmatic advice on how to charter your own destiny, especially when the odds are stacked against you." "Magdalena and I worked together in the early days of the Internet, introducing concepts that were completely revolutionary, such as the electronic wallet. She is a fearless entrepreneur who worked hard to help early online merchants get off the ground. Some of them went on to become giants, like Amazon. I urge women to be bold like Magdalena and follow their dreams." "I wish I could have given Magdalena Yesil's book to my two daughters when they graduated from college. It's the perfect gift for any young woman navigating her career. I am definitely giving it to my two girls, and just as importantly, to their boyfriends, too. "My professional mission is to empower women through fashion. Power Up resonated strongly with me. I highly recommend its confident career guidance from an impressive roster of top women leaders." "When I reached out to Magdalena in my early days of founding Pono, I benefited greatly from her wisdom and guidance. She is a pragmatic, down to earth person who helped me a lot." "Technology is changing how business is conducted in all industries. Women who seize technology related opportunities and put the advice offered in Power Up to work will confidently transform businesses and emerge as future leaders of the new economy." "Magdalena Yesil offers powerful leadership lessons from her journey to becoming a successful Silicon Valley entrepreneur and investor. She drops the reader into vividly recounted, career-defining moments to help them navigate and overcome gender bias in their own lives." "This book should be required reading for anyone building a company or making a career as we head into the Fourth Industrial Revolution. The lessons Magdalena Yesil offers from her remarkable work pioneering the commercial Internet are more relevant than ever." "Power Up offers the no-nonsense optimism and encouragement women need to persevere in technology, an industry where so much is stacked against them. It's crammed with sage advice and insider stories to enlighten the next-generation of women in tech."